Here is CNC4 GDI support class unit designed to repair alies. What can I improve? Any suggestiones? I kinda dislike the green, regardless of original design, it might be beneficial to make a version without it. Spotlight it, Donut . This looks goood. This one turned out quite well as I don't notice any black dots, and the texture doesn't look noisy ingame. Since there's a download, it belongs in the Voxel forums, by the way. EDIT: I'm not an expert on voxels so I don't know if I'm in any proper position to say this, but: Spotlight this! I'd say don't spotlight it, but when he gets around to them all, spotlight the pack. If you were doing extra missions for Firestorm, this would be a great unit to replace the old Kodiak with. It's the same quality that any of your C&C3/4 conversions. I just hate how RA2 treats voxels, I just hate it. Then units won't look like in teletubby land. And what will you suggest? Even if you give them a zero value, the way the units are lighted won't change. The side of the voxel facing west is always the brightest, while the top of the voxel stays in shadow. It's stupid, the sun doesn't shine from the horizon most of the day. You are right, but Westwood didn't expected us to mod this game. They developed their own plug-ins for Max that made unit's look the best with that lightning. Well if set those values and look at standard ra2 units you will see the difference in terms of glow at least. is to make sides darker and top lighter in color as my color said because their is a normals difference between aerial and ground units. Well Aro, they're ALL equally great quality and worthy of spotlight. Purpose of spotlight is so all the best are there and one doesn't have to sort through the masses, ie a combination of organization and prestige. Spotlighting the pack sybolizes the organization part. The ones asvnix has made are good, possibly because most of the aircraft designs in C&C4 were not nearly as hideous as the ground vehicle designs. It looks indeed awesome - but one thing bugs me. Is the original name in fact ARHANGEL and not ARCHANGEL? Probably almost nothing for now. For the first time,even with ingame pics,I can't tell if that unit can be good or not. It will depend entirely on how somebody will use it in a mod. I'm sure it could be made to move in reverse motion and,if the mod is well done,it would not seems strange. Maybe it could even use the 4 "legs" to move with the big parts as shoulders (would look like a rig with small legs ). 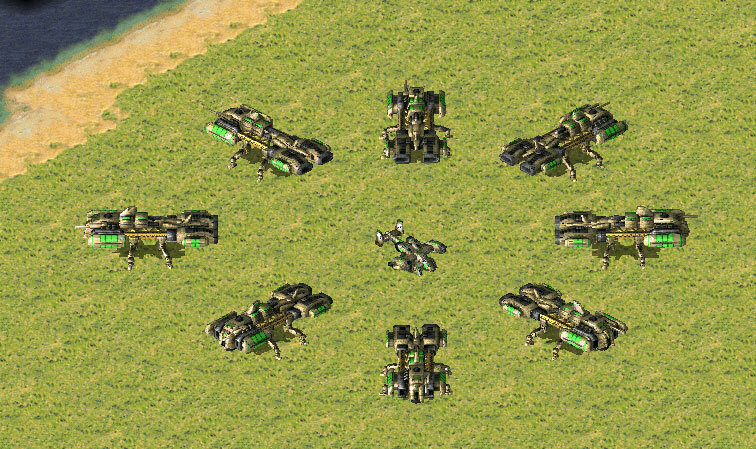 Will it have weapons,or will it use drones (I don't remember when that was implemented,Generals or before),time will tell,but in every cases,until the unit as part as a mod is complete,it will be hard to judge. For the record,I don't know the C&C4 unit,so I can't say anything about quality of conversion,details kept from the original,or stuff like that. Really great voxel, almost no black dots at all. I Disagree, the one in the middle of the image isn't that good for example. Yes, that's right about Spotlighting, but packs were never supposed to be released according to Banshee's rules, 1 Voxel / Map / SHP per Topic.